Dewar has been on a tear since being held scoreless in back-to-back games on Nov. 18 and Nov. 19. The 19-year-old forward had six points in three games last week, finishing with four goals and two assists. Dewar scored both of Everett’s goals in a 2-1 win over Kelowna on Saturday, then picked up the secondary assist on the game-winner and tacked on an empty-net goal in a 5-3 win over Portland on Sunday. He assisted on the game-winner again (the primary assist, this time) and added another empty-netter in a 4-1 win over Portland on Wednesday. 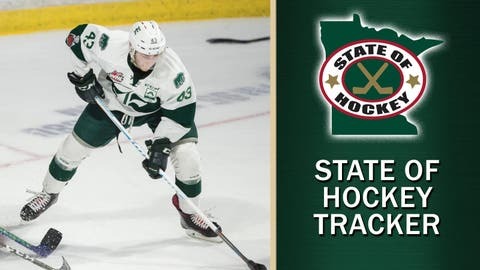 A third-round pick of the Wild in this year’s draft, Dewar now ranks second in the WHL with 22 goals and has been held without a point just three times this season. Sheehy was named the Big Ten’s First Star of the Week after leading Division I with four goals last weekend. The Gophers’ captain scored twice Friday in a 7-2 win over Michigan State, and did it again Saturday, scoring back-to-back power-play goals in the second period. The Spartans battled back, scoring four unanswered to earn the split, but it was a much-needed performance for Sheehy, who hadn’t scored since the Gophers’ win over Minnesota Duluth on Oct. 7. Giroux snapped out of a three-game funk last week, and now has a goal in each of his last three games. He scored the game-tying goal in a 4-3 overtime win over North Bay on Thursday, and scored the would-be game-winner early in the third period Friday, before Sudbury rallied for a 2-1 shootout win. He was back at it midway through the first period Sunday, scoring again in a 3-0 win over Owen Sound. Giroux was a fifth-round pick of the Wild in this year’s draft. — AHL rookie Kaapo Kahkonen’s hot start was enough to earn him a call-up. The Wild added Kahkonen to the roster for Friday’s game against Winnipeg with Devan Dubnyk dealing with an illness. He leads the AHL with a 1.35 GAA, a .956 save percentage and three shutouts through eight games. — Highly-touted Wild prospect Kirill Kaprizov has been in a slump lately, but broke through Wednesday after three games without a point. Kaprizov had a goal and an assist in CSKA Moscow’s 5-0 win over Dinamo Riga. — Minnesota Whitecaps players Hannah Brandt, Kendall Coyne Schofield and Lee Stecklein were named to the U.S. women’s national team’s 44-player training camp roster Wednesday. — UMass broke up the all-Minnesota top-3 in this week’s USCHO.com poll, claiming third and dropping Minnesota State to fourth. No. 1 St. Cloud State and No. 2 Minnesota Duluth were both idle, but held on to the top spots.